Mystic Seer School with Jane Schroeder and Australia's own Peta Condon. 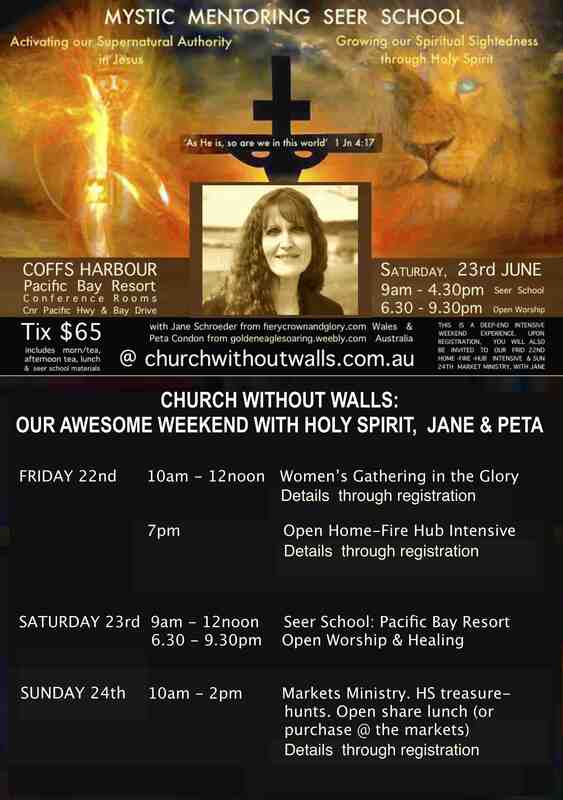 Our friends in Coffs Harbour and Mildura will both be hosting the one and only Jane Schroeder for a SEER SCHOOL with our very own home grown Peta Condon. Jane carries a mandate to release ‘Papa’s children’ into the working of miracles, signs and wonders as a part of their everyday lives as heaven invades earth. She is a passionate lover of Jesus, opening the wine realms of heaven wherever she ministers throughout the nations. Jane is a close friend and has worked closely with Justin Abraham and the Company of Burning Hearts for many years. She also is a facilitator and teacher with Ian Clayton and Grant Mahoney’s supernatural school ‘The Nest’. Jane’s specialty is equipping the saints in ‘Seer Schools’, where she teaches believers how to see into the unseen. Peta is known and loved here in Oz and lives in the south coast of New South Wale. Pete is a releaser of Papa's Kingdom upon the earth. She's passionate about empowering individuals to walk in the fullness of their inheritance as manifest sons upon the earth ; to govern and rule from heaven to earth. Her background is in pastoring, chaplaincy and leadership in christian ministry for over 30 years and travels extensively, ministering across the nations. Together these two are dynamite! Both locations have additional open meetings. Click below for flyers.